Cookies are disabled in your web browser. To shop with Detailed Image, please turn cookies on and then refresh the page. An incredible one step polish and protection product! Excellent polishing power to remove swirls, oxidation, etc. Looking to save valuable detailing time by combining multiple detailing steps? 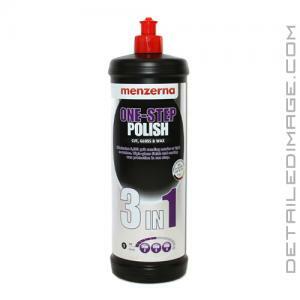 The Menzerna 3in1 Cut, Gloss & Wax will do just that! As the name implies this formula will polish the surface, enhance the gloss and protect it. Use the cutting power of the popular Power Finish PF 2500, 3in1 will allow you to polish away light to medium imperfections quickly and easy. This in turn will leave behind an amazing level of gloss, while finishing the paint down with the amount of clarity and gloss that we all strive for. If that wasn't enough, 3in1 will pair this corrective power with the protection of a high end wax. You will really enjoy the smooth slick feeling 3in1 leaves behind, allowing you to glide your microfiber towel across the paint with ease. We recommending applying this product by machine (Lake Country White Polishing Pad on a low speed setting) for best results. 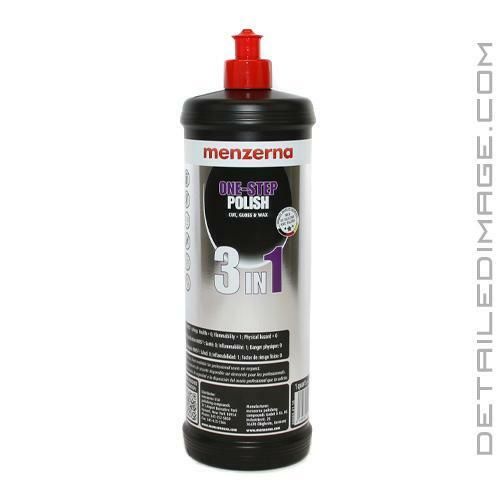 If you are looking for a polish that removes imperfections while leaving behind the gloss and protection of a carnauba wax, then the Menzerna 3in1 Cut, Gloss & Wax is for you. To learn more about Menzerna Polishes and the 2015 label name change please see the Menzerna Polishing Chart. Eliminates 3,000 grit sanding marks or light scratches. High-gloss finish and sealing wax protection in one step. Great product excellent results. Easy wipe off ,I have paired this 3-in-1 with Meguiar's soft buff cutting pad and finishes down really great. Pros: Economical on your pocket.Finishes down pretty well with a layer of wax protection for at least 3months. Cons. None so far. If you do fine any cons your maybe asking to much from an AIO in your process. This was an awesome buy and is definitely now part of my go to Arsenal! Like others have said...a little goes a long way and the results are awesome for an all in one polish. A little goes a long way. Has very high-quality carnauba wax that's left behind. Has great defect removal. PRO TIP - Let the residue dry a bit before trying to remove to make life easier, use one towel to break the surface and buff most of it off, then come in with a second towel and buff to a high gloss shine. I just wanted to reach out and say thank you for the fantastic service you always supply. My orders always arrive before I expect them.